Princess Anna from Disney's Frozen in extraordinary detail! Hand-painted statue derived from an original animation model. Sculpted under the supervision of Frozen art director Michael Giaimo! Numbered limited edition of 5,000 stone resin pieces. 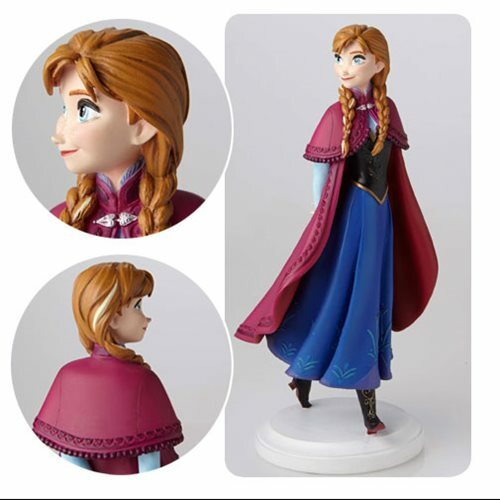 The Walt Disney Archives Collection Frozen Anna Maquette Statue is a marvelous figurine that captures Princess Anna from Disney's Frozen in extraordinary detail as seen in the original animator model for the film! A numbered limited edition of 5,000 hand-painted stone resin pieces, she comes with a matching hand-numbered certificate of verification and a story card. The fearless girl measures approximately 10 1/4-inches tall. This limited edition, hand-painted sculpture is derived from an original animation maquette. Production molds were made from a digital 3D scan of the animator model. The original was unpainted and did not include Anna's signature cape. For this reproduction, a sculpted cape was added under the supervision of Frozen art director Michael Giaimo, who said, "The exuberant and playful characteristics of Anna suggested a winter outfit of bold proportions. It was imperative that her costume be as iconic as the character herself. Her rich, saturated cobalt blue dress, black bodice, and striking magenta cape underscore not only the character's strength, but also stand in beautiful counterpoint against the snowscape environments of the film." The Walt Disney Archives collection celebrates the rich history and majestic artistry of the Walt Disney Company, revisiting seldom seen original treasures, from animation maquettes to archival stationery. Established in 1938, the Character Model Department at Walt Disney Studios employed sculptors to create three-dimensional figures known as maquettes. These animator models would expose crucial angles, reveal the play of light and shadow, and clarify issues of perspective, allowing artists to study each character in a brand-new way.